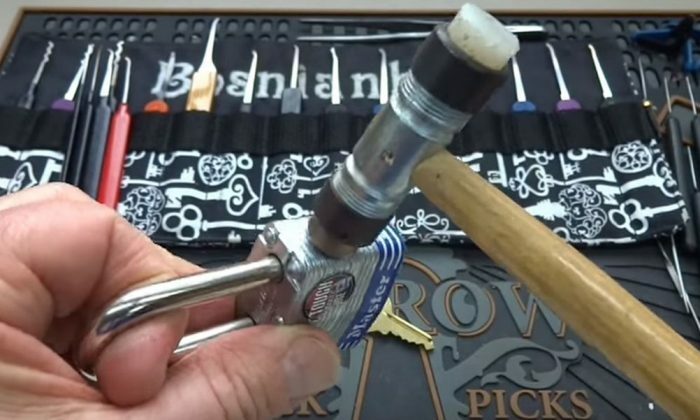 A viral YouTube video shows how it easy it is to break a Master Lock No. 3 lock with a small hammer. Master Lock responded to the clip on Facebook, saying that any security device like a lock can be manipulated. “We recognize that there are those who attempt to challenge the integrity of security products for sport. With the proper time, knowledge and tools nearly any security device can be manipulated – especially in a controlled environment by a dedicated locksmith or security expert,” the lock maker wrote in a post. However, some people dispute Master Lock’s claims. “Will Master Lock be giving refunds to those of us who entrusted our valuables with your products?” wrote one person. One person apparently went the extra step and posted his incredulous account of removing nearly 1,000 locks after watching the video–and it turned bizarre quickly.